According to Vedic science, when Spirit (Purusha in Sanskrit) takes form as life it is called Prakriti. Prakriti is made up of five elements from finest to grossest: space, air, fire, water and earth. In Sanskrit they are called Akash, Vayu, Agni, Jal, and Prithvi, respectively. 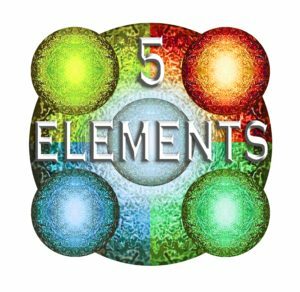 Every individual is a microcosm of nature and therefore contains all five elements. Let us examine each. As Spirit takes form it passes first through space or Akash. The Akash element corresponds to awareness itself. It is the layer beyond the other four gross elements and is responsible for the transmission of sound, including mantra. It is the home of potential and possibility. Akash animates Vayu or air, which allows for movement and thought, and it connects us to the sense of touch and the all-important breath. Akash and Vayu combine to form the Vata dosha in Ayurveda. Fire comes next and is responsible for heat, desire, motivation and the sense of sight. It allows us to want something, see where we are going as we get it, and digest it once we have it. Agni allows for transformation and Agni dominates the Pitta dosha. Fire then animates water or Jal, permitting flux, emotion, cohesion and the sense of taste. Excess Jal will lead to unnecessary emotional and sensory dependence. Lastly, physical form corresponds to earth or Prithvi. Anything we can smell contains Prithvi. It is the seat of stability when balanced. Jal and Prithvi together create the Kapha dosha. The spiritual path is walked in reverse, however, from gross to fine. Prithvi allows the body to become stable, followed by the balancing of Jal, emotion and senses. The stable body and emotions vanquish the struggle of Agni, desire. With deep breathing, Vayu, we connect to present moment. Finally, experiencing the Akashic realm, one rests in his true nature. The Yogic Masters tell us that God-consciousness is beyond all of it.